Seattle, Washington - Sept 29, 2017 -Vitamin Packs, the next generation vitamin subscription service, was honored at this week's Informa SupplySide conference with the 2017 Editor's Choice Award for top consumer packaged good (CPG) in the multi-vitamin category. Vitamin Packs received the award based on the company's innovation in personalized nutrition and market impact. 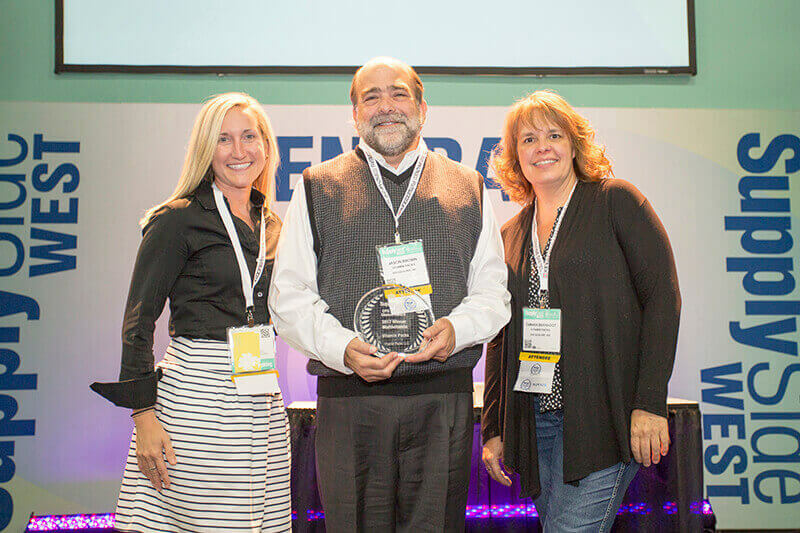 Informa's Natural Products INSIDER editorial team presented the award on September 27 at the Mandalay Bay Resort in Las Vegas, Nevada. "We are honored to receive the 2017 SupplySide CPG Editor's Choice Award for the multi-vitamin category," commented Jason Brown, founder and CEO, Vitamin Packs. "Vitamin Packs has grown by leaps and bounds in the mere three months since our launch and this award recognizes the importance of a customized approach to nutrition. Our Sage technology, created by our science advisory board and team of nutritionists, uses a comprehensive assessment of lifestyle habits, dietary preferences, as well as prescription medications to deliver a truly unique combination of vitamins and nutrients for users. With more than 15,000 people taking our nutritional assessment, we see the value in offering personalized vitamins with more than one trillion possible combinations." The annual SupplySide CPG Editor's Choice Awards recognize innovative finished products launched by CPG companies in a variety of categories. Informa's Natural Products INSIDER editorial team received nearly 400 nominations for this year's award program, which spanned 27 categories. The judges trialed each product and narrowed the nominations to the top five in each category. "Personalized nutrition is the buzz across the healthy products industry, and Vitamin Packs has tapped into consumers' interest in truly maximizing their health," said Heather Granato, vice president of content, Informa Global Health & Nutrition Network. "The online assessment tool, direct delivery and individual package design further speak to a desire for a convenient solution that really delivers value."